With the advent of CSS3 transforms, we can do some nice tricks with elements in a web page, including rotation, scaling, and skewing. Once we start throwing jQuery into the mix too, we can start doing some really nice tricks! In this tutorial I’ll show how you can use CSS3 transforms, along with some jQuery, to add smoothly rotatable photos to a web page. You can try it out right now by clicking the “View Demo” button above. Hold down Shift, then click and drag on a photo to rotate it. I’ve based the code on this photo light table tutorial that I wrote a couple of months ago. In that tutorial, you could drag photos around the table, and click a photo to view it in a lightbox. Now, with this latest addition, you can also Shift-drag a photo to rotate it smoothly about its centre. Nice! I should point out that this tutorial won’t work in IE at all, since IE (as of version 8) doesn’t support CSS transforms. I suspect it might work in IE9, although I don’t have it to test with. It also won’t work in touchscreen mobile browsers (yet) due to the lack of a Shift key! Here’s how to code this baby up. Bear in mind that we’re starting with the script from the last tutorial, so if you want to follow along then you can download that code and work from it. mouseStartAngle will hold the angle of the mouse at the point where the user starts Shift-dragging, while imageStartAngle will hold the rotation angle of the image at that point. We’ll use this information to calculate the new rotation angle of the image during the rotation process. In the previous tutorial, we randomly rotate each photo as it’s added to the table to create a pleasing “scattered” effect. Now, if we’re going to allow the user to rotate the photos with the mouse, we’ll need to know the initial rotation angle of each photo. We produced the original random angle in degrees, but radians are actually easier to work with when it comes to calculating rotation angles. So we convert the angle to radians when we store it, using the formula: radians = degrees * π / 180. The original light table uses the jQuery UI Draggable plugin to make the photos draggable. This is great, but it will also get in the way of our new rotation code. This is because, when the user Shift-drags a photo to rotate it, the Draggable plugin will intercept the dragging action and move the photo instead. This function checks if the user is currently rotating an image by looking at the value of imageBeingRotated; if it’s not false then an image is being rotated, so we return false from dragStart(). This tells Draggable to cancel its drag operation. We’ll write the startRotate() function in a moment. The user Shift-clicks to start rotating. This fires the mousedown event, which triggers our startRotate() function. No problems there. The user drags to rotate the image. Again, no problems here. The way around this is to explicitly assign each photo’s click event to a custom event handler function, which only opens the lightbox if the user isn’t in the process of rotating an image. We can also delete our now-redundant addLightbox() function from the code. There’s a little bit more to this workaround, as you’ll see when we come to write the stopRotate() function! Now that we’ve set everything up, and stopped the 2 jQuery plugins getting in the way of things, we’re ready to start writing our rotation code! startRotate() is triggered whenever the user presses their mouse button while over an image. However the user might not be rotating — they might be starting to drag the photo around, or just clicking it to open the lightbox. We only want to start rotating the photo if they’ve held down Shift as well, so we use the handy shiftKey property of the Event object to determine if Shift was held down. If it wasn’t, we exit the function straight away. We need to store the clicked image in the global imageBeingRotated variable, to let other event handlers know that we’re currently rotating the image. It’s easy to get the clicked image, since jQuery passes it to our event handler via the this keyword. We need to record the angle of the mouse relative to the centre of the image at the start of the rotation. Then, when the mouse is later moved, we can compare the new angle to the start angle to work out how much rotation to apply. We get the centre point of the image by calling a getImageCentre() function (we’ll write this in a moment), then compute the X and Y components of the distance between the mouse and the centre. Then we use Math.atan2() to find the angle between these 2 points (relative to the x axis), which we then store in the global mouseStartAngle variable. We also need to store the rotation angle of the image at the point where the user starts to rotate it. We can then use this figure to calculate the new rotation angle for the image once the user has moved the mouse. Since we always store an image’s current rotation angle in its jQuery object as currentRotation (see Step 3), it’s easy to pull this value out and store it in the global imageStartAngle variable. We attach the mousemove handler to the document, rather than the image, because the user might drag the mouse outside of the image as they rotate it. The last thing our event handler does is return false. This tells jQuery that we’ve now handled the mousedown event, so it shouldn’t trigger any other event handlers that might respond to this event. // Cancel the image rotation by setting imageBeingRotated back to false. // to prevent the lightbox appearing once the Shift key is released. The first thing the function does is check that we’re actually in the process of rotating an image. If not then it exits. If we are rotating an image then the function first unbinds the rotateImage() function from the mousemove event, so that future mouse movements no longer trigger rotateImage(). The function also needs to set the global imageBeingRotated variable to false, to tell other event handlers that we’re no longer rotating an image. Rather than doing this directly, the function uses setTimeout() to set the variable to false after 10 milliseconds. Why on Earth does it do this?! Well, remember from Step 6 that a mousedown followed by a mouseup also fires a click event. What’s more, the click is only fired after the mouseup event handler has finished. So if we were to set imageBeingRotated to false within stopRotate() then it would be false by the time the openLightbox() click handler was called. This would then cause the lightbox to pop up every time the user released the mouse button after rotating an image! By setting imageBeingRotated to false after 10 milliseconds, we give stopRotate() time to finish and fire the click event, calling openLightbox(). Since imageBeingRotated will still be true at this point, the lightbox doesn’t pop up. Then a fraction of a second later, imageBeingRotated is set to false. If the Shift key isn’t being held down when the mouse is moved, or imageBeingRotated equals false, then the function simply exits without doing anything. This code is much the same as the code in startRotate(). Now that we have the new mouse angle (mouseAngle), we can subtract the mouse angle at the start of the rotation (stored in mouseStartAngle) to get the angle that the mouse has moved since the start. By adding this to the angle of the image at the start (imageStartAngle), we get the new rotation angle for the image. Now it’s simply a case of setting the CSS3 transform property (along with the vendor-specific versions) to the new rotation angle, thereby rotating the image. The function also stores the new rotation angle of the image within the jQuery object as currentRotation, and returns false to stop the mousemove event being propagated further. This function, getImageCentre(), is called by startRotate() and rotateImage(). It’s used to calculate the centre point of an image that is being rotated. This was actually the hardest part of the code to write. Getting the centre point of an image that has been rotated via CSS3 transforms is not easy! To get the centre point, we first need to call the jQuery offset() method to get the image’s offset — that is, the coordinates of the top left corner of the image. We can then add half the image width and height to these coordinates to calculate the centre. The problem is that, when you ask for the offset of an image that’s been rotated in CSS, most browsers don’t give you the top left corner of the actual image. Instead, they give you the top left corner of the larger bounding box surrounding the image — that is, the non-rotated rectangle that completely encloses the rotated image. 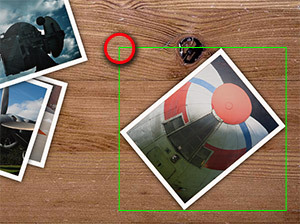 This corner point moves around as the image rotates and the bounding box changes size, making it very hard to use it as a basis for calculating the image centre. Most browsers, including WebKit browsers and Opera, return the rotated image’s offset as the top left corner of the bounding box — not the image! Just to complicate matters, Firefox (as of 4.0 beta 3, at least) does actually give you the top left corner of the image itself, as if it wasn’t rotated at all, which is exactly what we want. It’s the only browser that does, though. I’m not sure which browser is correct, or if getting offsets of rotated images is even mentioned in the CSS3 spec (I don’t think so). Anyway, after experimenting with some hideous trigonometry to try and calculate the original, non-rotated offset, I gave up and decided to think outside the box instead (pun intended!). Temporarily rotate the image back to zero radians (so it’s straight). Get the offset and use it to calculate the image centre. Rotate the image back to its previous angle. This avoids the whole problem of getting the offset of a rotated image, since the image isn’t rotated at the time we read the offset coordinates. Here’s the demo again. It works pretty smoothly, even on my old rusty Core Duo iMac. Firefox 4 is the smoothest of the browsers I tested, followed by WebKit browsers (Safari and Chrome), followed by Opera. As I said at the start, it won’t work in IE8 or earlier due to lack of CSS transform support (although it doesn’t give any errors). It won’t do much in iOS 4 either, since there’s no such thing as holding down a Shift key on an iPhone. I suspect the code could be rewritten to allow rotation using a 2-finger rotation gesture — maybe a project to try once jQuery Mobile hits the streets! I hope you enjoyed reading this tutorial (and the other “Kitchen Table” tutorials that went before it), and feel free to use the rotation code in your own projects if you like. wow great!! only 1 thing i’d like to ask: is there a way to add a resize function to this? i have a basic basic understanding of jquery and tried some things up to now, but didn’t get it. and … it still works 🙂 but without resizing 🙁 would be great if you could once look over it if i have overseen smth or if i did it completely wrong? …don’t you want this instead? Does the code branch for the alt key in rotateimage() actually run when you alt-drag? You could use console.log() to write a message to the console if that code branch is being run. Then you know that the alt-drag is at least being detected. Also if you can post your complete modified page’s URL here then it will be easier for me to see/debug. actually i never used the console for debugging 🙂 which is a great tool! it now tells me that my “thiswidth” variable in the startrotate() function is not defined. i sent you the url via pm. @wursti: It looks like you’re creating thisWidth/thisHeight inside initPhotos(). These are local variables, so you won’t be able to access them inside startRotate(). You’ll need to make thisWidth/thisHeight global. Also why are you using thisWidth and thisHeight inside startRotate() I don’t think they are arrays, are they? BTW I know you emailed me the URL but could you also post it here please, so others can help & benefit? anyways, i got it now 🙂 it has been several mistypings in variable transfer and, as you said, 1 or 2 global local variable problems. but the thing with thisWidth and thisHeight: well, i don’t understand why, but it does not work without the square brackets (then i just get back “[object object]”). and it can be as well thisHeight instead of thisHeight – for whatever reason. & thx a lot for your great help !!! Do you mean the lightbox image? Or alternatively, add “previous” and “next” links to the lightbox (maybe using Colorbox’s “html” setting), and add click handlers to the links to move between the photos. damn, sorry @abhishek198 – i mistakenly reordered my files! I tried to implement same to using jquery-mobile. since i was new to jquery-mobile i was not able to achieve it. can you please provide solution or some suggestion to develop using jquery-mobile. Is any option to store the collage, that the user created in the front end. I could able to change the position/ rotation etc. Can I store the data for later use. The nearest you could get would be to store the parameters and settings in a persistent cookie. Matt , Great Gallery plugin. Can we add rotate corner on each image for rotate pic instead of shift key rotate option. If yes then how can we add, can you please suggest how can we implement? Man, it was written FIVE years ago, the world [and Matt] have moved on, and it is a tutorial intended to get you in to the coding of it and therefore allow you extend and improve it as you see fit. Try it, test it and if it works, come back and tell us, and how you integrated the ‘feature’. Or you can publish your own code [always accrediting Elated with the original idea please].